I'm in danger of becoming obsessed with Rend Collective Experiment. After spending the jubilee bank holiday under canvas at a music festival called The Big Church Day Out, I've been awoken to a whole new world of music. I've had a massively joyful introduction to those much talked-about bands that I didn't think I was cool enough to listen to. As a general rule, I don't buy music unless I'm celebrating something (although this might change when I finally start earning!). Since it was my birthday last week, however, I allowed myself to indulge. 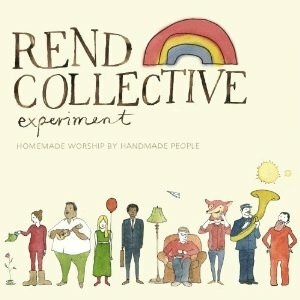 I can't recommend 'Homemade Worship by Handmade People' by Rend Collective highly enough - the whole thing is a celebration in itself! The lyrics are stunning, dealing directly with human-God relationships. They're honest enough to resonate with my 'concrete heart' but joyful enough to remind me that Jesus is exactly what we need - only God satisfies. 'You are my vision' is a rousing rendition of a favourite old hymn, but 'Build your kingdom here' was the first track to get stuck on repeat. The more I listen, however, the more I'm persuaded that 'The Cost', with its simple yet powerful message about God being worth everything, is the gem of the collection. Having said this, there isn't a single song on this CD that I don't love; this album excites me for two reasons. First, it uses refreshingly honest lyrics about real life to point to Jesus. Second, musically it is amazing. It's rare to find such a winning combination. I often find its the lyrics to songs that stir my affections and focus my attention in either the right or wrong place, but such an enjoyable well-crafted combination of music and words reminds me just how good God is for giving the gift of singing and dancing. Hailing from Ireland, and generally producing a joyful blend of folk-pop that seeks to see more, do more and generally experience more of God, the band would rather refer to themselves as a collective of musicians. 'Welcome to the family!' reads their website, from which you can obtain the record I'm raving about. Trendy perhaps, but I think they make well the point that music isn't about celebrity, looking cool or having it all together. I can't imagine how this isn't the kind of music that gets everybody screaming from their rooftops (or at least blogging from their sofas), but of course, it's a matter of style. This might not be everyone's 'cup of tea' but I I'm ecstatic to be discovering Rend Collective for the first time, in slight disbelief that it's taken me this long! The words are unmistakably christian, and God is certainly at the centre of this record, but I want to recommend it to every friend, regardless of their beliefs about Jesus or lack thereof. This is musical mastery 'for all, not just the religious'.